Last year I tried to get everyone to throw out the all-too-common turkey and go more traditional with a Christmas Goose. Don’t get me wrong: I LOVE turkey, in every way, shape and form. My problem with turkey is no one seems to want to cook anything but turkey for every holiday gathering. Here I go again; this year it is with ham. 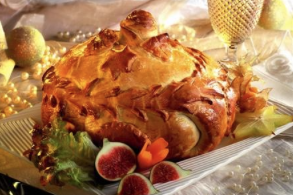 The tradition of eating ham for Christmas came from a pagan tradition from the pre-Christian Germanic and Norse tradition of killing a boar and serving it to honor Freya or Frigg(Frija), one of the Norse Gods. St. Stephen, whose feast day is December 26th, is often depicted as serving a boar’s head as an offering. The two were combined and there you have it...a new tradition is born. We’ve all seen the big hams with the criss-cross slices dotted with cloves and draped in pineapple rings and cherries. Below are two takes on the Baked Ham; let’s hope they will become new “standards” for you, whether it is a holiday or not. The type of ham referenced in these recipes can be either a partially or fully cooked, mild - cured ham for simplicity’s sake. A dry cured ham takes 24 hours to soak/prepare/cook. They are delicious, but do take much longer. It is your choice. Most likely, you will buy a ham that has the skin and most of the fat trimmed off, but if not, follow these instructions. If it is trimmed up for you, skip this first section and proceed to the second. Place the ham in a pot just large enough to hold it snugly. Cover it with water. Throw in carrots, celery, bay leaves, bouquet garni and orange zest. Pour in the orange juice. Bring to a boil, then turn the heat down and simmer for an hour and a quarter with a lid on, skimming fat when need be. Remove from the heat and allow to cool for half an hour in the broth. This will allow the flavours to really penetrate the meat. Strain the broth, and use as a base for soup or sauce. Remove the meat to a board, cut off the skin and all but ½ inch/1cm of fat. Score the fat left on the meat in a criss-cross fashion, making sure not to cut into the meat. Season it generously with the ground black pepper. Stud the fat at the edges of the diamond cuts with cloves evenly over the entire ham. Place the meat in a roasting tray and roast for 20 minutes until the fat renders and becomes slightly crispy. Remove from the oven. In a small bowl mix the marmalade with the rosemary leaves. Evenly spread it all over the meat with a spatula. Place the ham back in the oven for about 1 hour and baste frequently until beautifully golden and crisp. Remove from oven, and let rest, tented with foil for 15 minutes. Discard the cloves and slice. In a large saute pan over medium heat add the oil. Saute the shallots and mushrooms for 8-10 minutes (most of the liquid from the vegetables will have evaporated). Add the wine to the mushroom mixture. Raise the heat to medium high and boil until most of the wine has evaporated. Remove the fat from the ham with a knife. Cut the upper two thirds of the ham into thin horizontal slices, piling them on a plate in the order sliced. Leave the bottom third unsliced. It will act as a “seat” to stabilize the slices once put back together. Spread a spoonful of the mushroom stuffing in the center of each slice, top with the next piece of ham and repeat, finishing with the top piece of ham. It should resemble the original shape. Wrap the ham in the cheese cloth. Sautee vegetables in butter and oil for about 10 minutes in a large oven proof casserole or roasting pan. Place ham upright wrapped in the cheese cloth over the vegetables. Add parsley, bay leaf, peppercorns, thyme, cloves, wine and stock. Bring to a simmer on the stove, cover and place in the middle of the pre-heated oven. Braise for 2 ½ hours. Baste every 20 minutes. 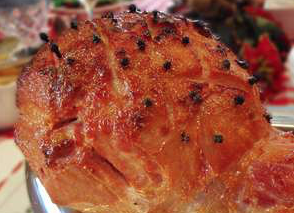 The ham when cooked should reach an internal temperature of 140F/60C. When ham is done, remove from casserole and let cool on a cutting board. Roll out the puff pastry into a large enough rectangle to completely wrap the the ham. Seal the edges by wetting them with water and pressing together. Poke a couple of holes to let the steam escape. Brush with beaten eggs. Decorate the base with any remaining dough if you wish. Bake in pre-heated oven 30-40 minutes or the dough is golden brown.